I was with my buddy, Nick Varano, the other night and he looked at me and said, “Do you realize, you wrote a book?” There are many authors who would think, “Sure, do it all the time, no big deal.” But being kids who grew up in East Boston, I know he was really saying to me, “Lou, you wrote a book – can you believe it? I’m so proud of you.” He, of course, was indicating that it was a huge accomplishment, maybe even more so, because kids from our neighborhood were not writing books every day. In fact, there are probably not many, if any. The funny thing is, I don’t feel like writing the book was very hard. In fact, it all just flowed. The reality is, writing the book is the easy part. What comes next, the business side, is much more difficult because there is more to writing a book than just writing a book. Gary Krebs, VP & Group Publisher for McGraw-Hill, emailed me this week asking me to tell him how many books I think we are going to sell, because they are going to print. I’m a publishing rookie – I haven’t a clue. He’s asking me, because as an author, it’s my job to assist in the marketing, PR and sales of the book. It’s not just about Elizabeth (Elizabeth King, my co-author) and I handing in our manuscript and being finished. Our deadline was May 1st, yet we have been working ever since we handed in the book. First, with some initial rewrites and proofing; then, with painstaking, fine-toothcomb proofing. And it’s not just Elizabeth and me; there is a team at McGraw-Hill led by senior editor, Pattie Amoroso, as well as my wife, Patricia, and our close friend Jo Newell, who has been published and has proofed books in the past. Sure, these are all things that most would expect. Even working on the cover design with the publisher does not seem out of the ordinary. But if you have never written a book, you should know that there is much, much more. You have to send out pre-proofed PDF’s of the book to folks you think will like the book and ask them to write quotes saying how wonderful it is; you have to create bulk book incentive packages and solicit companies to make purchases (by the way, if you buy books for your company, please drop me a line – I have some books to sell you); you have to plan a book launch party, work on a marketing campaign, create lists for outreach, work on concepts and promotions for book signings, call in favors – it’s a very detailed and time-consuming process. McGraw-Hill is a huge publisher and they are fantastic, but they publish so many books, that it’s in our hands to really make the difference. Did I mention we have also had to set up a web site and all the social media that is necessary these days? Thank goodness for Kelly Downing and the Heavy Advertising brass, Scott Heigelmann and Joe Del Buono. We also have to reach out to bloggers and contacts to see if they will assist in helping promote the book. And, then there is the legal crap that always comes with anything you do. So, writing a book is not just about writing a book; it’s impossible to just do it yourself – you need a team to assist and a village to help. Fortunately, everyone we have reached out to has been wonderful and very supportive. It has been a fabulous and humbling experience because it wasn’t just me who wrote a book, it was a team of great people, and it’s not just me marketing a book, it’s a great community of folks lending a hand. So if you are thinking about writing a book, please know that there is much more to it than just writing. Get ready to roll up your sleeves to make it all become a reality and make sure you surround yourself with a bunch of great people. I have a great team and very generous contributors to all aspects of our book and have to give them all big hugs and props for their efforts and generosity. Help me thank them. 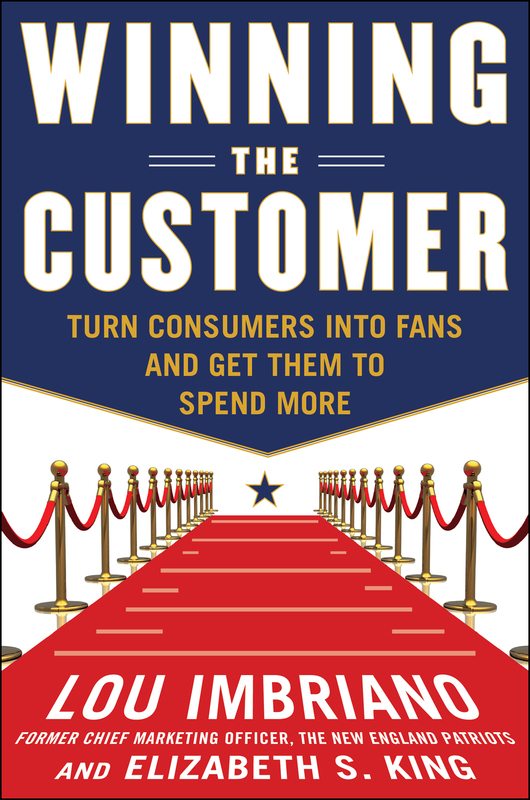 The best way is to join in and spread the word and, ummm, buy a copy of Winning the Customer, now available pre-sale on Amazon. Sorry, couldn’t resist. There are 11 responses to "There Is More To Writing a Book Than Just Writing A Book". Very much looking forward to it, Lou. All your hard work will produce better informed people who will go on to make a difference. I’m glad to watch this come together. When I was in the music business, sometimes someone would ask me after a show, “So, what do you do for a living?” They had no idea how much work went into planning, contacting, following up, checking contracts, travel planning, practice, and all the rest of it. All they saw was a guy playing music, and that’s the way it should be. We’re doubly lucky: We get to love what we do and do what we love, and we both realize how lucky we are. Thank you for your comment and constant support Roy. It’s funny, I was in radio and then with the Pats and most people thought, “wow, cool jobs.” ~ which they were. But they also were a whole lot of work. I have been blessed with great opportunity and wonderful people surrounding me. I am thrilled to know you and very happy that you truly enjoy and love what you do. you never cease to amaze me with your adventures online. Congrats on becoming a published author and I can’t wait to hear more about the behind the scenes adventures. Quick question. You mention that publishers are now expecting authors to do most of the work in building up the buzz around their book, do you think that is a shift brought about recently through advances in social media communication and publishers just can’t keep up so they “outsource” the efforts? Or have they always let the authors market their own books traditionally? Dream, Build, Inspire, Lead!…and Stop Working Smarter! Thank you for the kind words. Just think a year ago you were giving me tips on writing a blog . I am not sure if there is a shift in practice with publishers, I think I always assumed they were the total engine behind the process. But, yes, social media definitely adds in a new dynamic to the entire project. So if you are planning on writing a book, get ready to do more than write. Thanks again pal. AJ–the publishers-expecting-authors-to-do-legwork thing is not a new thing. Someone joked with me when I wrote Outsmarting the SAT in 2007 that if my name were only “Steven King” instead of “Elizabeth King” I’d get a *lot* more assistance. Lou – You have captured the essence of what it takes to write a book, showing both the demanding hidden aspects (including the support team you have created who believe in both you and the project) and the passion it takes to accomplish such a task. Congrats! I’ve worked with the team at McGraw-Hill before – you’ve got good backing there, not to mention the support and respect from those of us that know you and your dedication to your work. I think the reality of this will hit you when one day, in the middle of an airport somewhere, somebody says “Hey, you’re Lou Imbriano! I read your book. It was great”. Thank you Fred. I appreciate your insight and your encouraging words. McGraw-Hill has been great to work with. 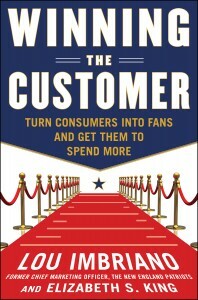 I don’t ned to me recognized, but I do hope every one that reads Winning the Customer enjoys it. What strikes me as the most impressive about you Lou, is that you understand what it takes to move the chains. It’s a methodical, dogged and focused determination that leads to your success, no matter what field your game. Congratulations, Lou. I’m very happy for you and Elizabeth! Best, M.
I appreciate your kind words and constant support. Yes Molly, Lou has given great advice to future authors, and authors need to decide is it really a good use of your time to do all the promotion yourself. Much success Lou, sent you DM. Thank you Michelle. I look forward to chatting.